9' x 4'2" x 2'5 1/2"
On display in the showroom at the workshop, for sale at £8000. 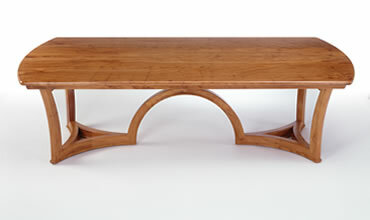 The top of this table is from four magnificent flawless bookmatched boards of Yew - finer than I have ever seen anywhere. The base is in one piece with the mitres and mouldings keeping the eye moving from one end to the other. The faces of the legs and hoop stretcher had to be slightly hollowed to follow the sweeping curves of the triangular ends.